One lucky winner will win a $25 Wal-mart gift card to buy whatever they may need! You can buy diapers, groceries, or even toys! The sky is the limit as long as it's carried in Wal-Mart! To see why P&G is so graciously sponsoring this giveaway, I would love for you to see how One in 10 Kids is North America are treated by Children's Miracle Hospitals each year. Open to residents 18+ in United States. Come back daily for extra entries for daily secret word or tweeting! Winner has (48) hours from time of being notified to claim prize or another winner may be selected. Winner will be selected at random from all eligible entries received. Disclaimer: This blog was not compensated for this giveaway. 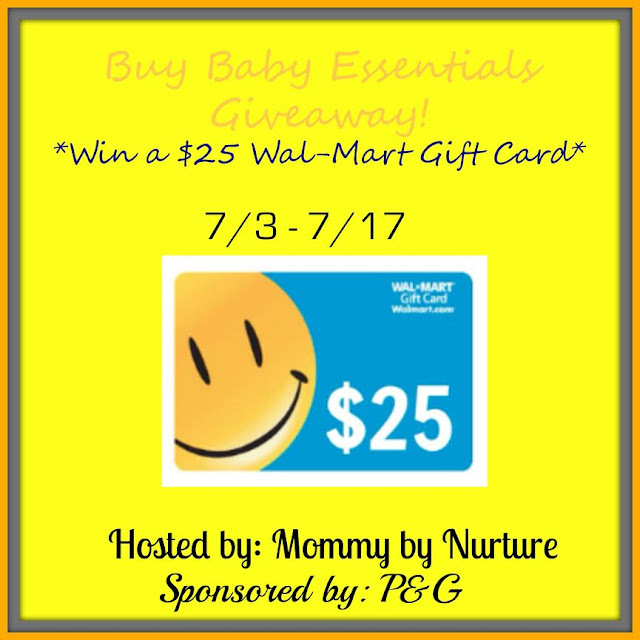 Mommy by Nurture may have received compensation for her feature article and to host this giveaway. This giveaway is in no way affiliated with Facebook, Twitter, Instagram, or any other social media platform. I would use on summer items that are needed in house. I would use this gift card towards groceries.